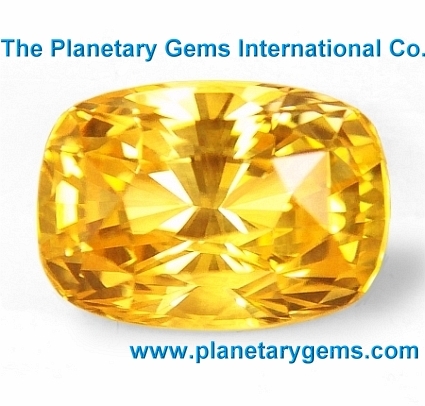 Astrological yellow sapphires: High quality, untreated, jyotish gemstones for Vedic purposes. Yellow sapphire belongs to the mineral specie Corundum or Aluminum Oxide, with chemical formula Al2O3, that forms in prismatic tabular, bipyramidal or rhombohedral crystals, as well as granular or massive habits, and may be transparent to opaque. The yellow colour is given by traces of iron in low concentration. Yellow sapphire helps in better clarity, focus and therefore better decision making ability. repeated 19 times at the time of wearing the yellow sapphire talisman. Wealth, name, fame, success and honor. The native will not be a moderate but an extremist.